I catch a lot of jokes from colleagues about being old. I'm nearly 39. Most of my friends and coworkers are in their 20's or early 30's. While the jokes annoy me from time to time, I think when it comes to writing wrestling blogs, age has its advantages. I can remember the very first Wrestlemania. I was 12 years old in 1985, when the first Mania took the world by storm. For fans who like to read about how things use to be can do that hear and know that they are getting a first person account, and not an update from Wikipedia. 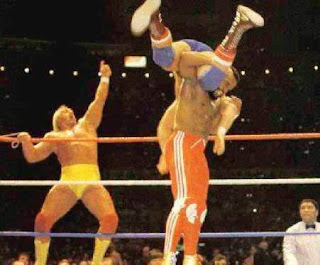 March 31, 1985 is the birthdate for Wrestlemania. My dad, brother, uncle, and I joined some friends at their house for the replay on closed circuit television that night. Back then I rooted for all the faces, so you can imagine my shock when Barry Windham and Mike Rotunda lost the tag team titles to the Iron Sheik and Nikolia Volkoff. Not only did they lose the belts, but Junkyard Dog came up short in his quest for the Intercontinental title. I was crushed. Of course there was plenty of triumph that night too. Wendi Ritcher regained the women's title and of course Hulk Hogan and Mr. T reigned supreme over Roddy Piper and Paul Orndorff. 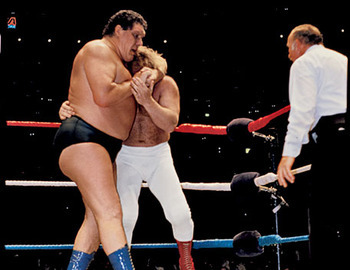 Andre the Giant was able to body slam Big John Studd and the fans in Madison Square Garden were treated with some cold hard cash until Bobby Heenan snatched the bag of loot from Andre. In my future "Mania Memories" blogs I plan to talk about specific moments or matches, but I feel like this first entry should encompass the entire Wrestlemania card. It was a big deal back then and I think is one of those moments that hooked me for life as a wrestling fan. Thanks for reading.